First sea fish on 'proper' gear. This morning I took a new friend, John Clarke, fishing. John's done plenty of coarse angling in his life but apart from the occasional mackerel feathering boat trip he said he'd never caught a 'proper' fish from the sea. John and his wife and son are on holiday in Dorset for a couple of days and with the weather and sea calm it was too good an oportunity to miss. If he was shocked when I suggested that we meet on the cliff top at 05:00hr he didn't show it. He arrived on the dot at five and I suggested that he set his spinning rod up before we left the car so he could see what he was doing. I loaned him a small buoyant Rapala thinking that it would be least likely to snag the kelp or rocks in the dark. 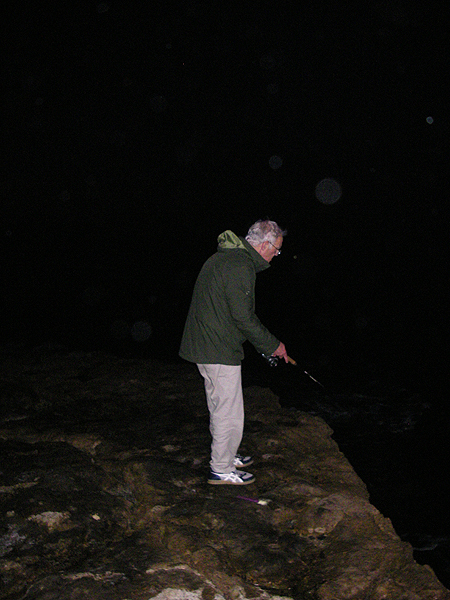 I was fishing with my home made, size 4, luminous 'Mepps' armed with a treble hook (not really ideal for these fish). We scrambled down to a flat ledge about two metres above the water and began to fish. I watched my pal make a couple of casts to check that he was OK and then I joined him. It was still pretty dark when we started with just the faintest glow of dawn showing in the east but my spinner was murder. I was getting bites straight away and after only two or three casts I was in. 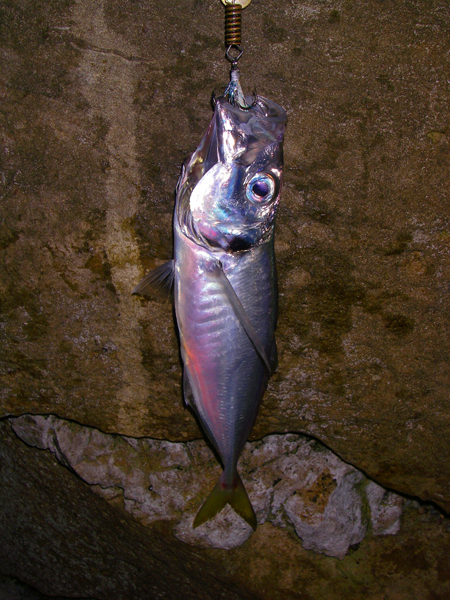 I wasted a bit of time taking pictures but it was soon obvious that my spinner was the thing as it had been before - with a constant stream of bites on every chuck unless I hooked yet another scad or mackerel. 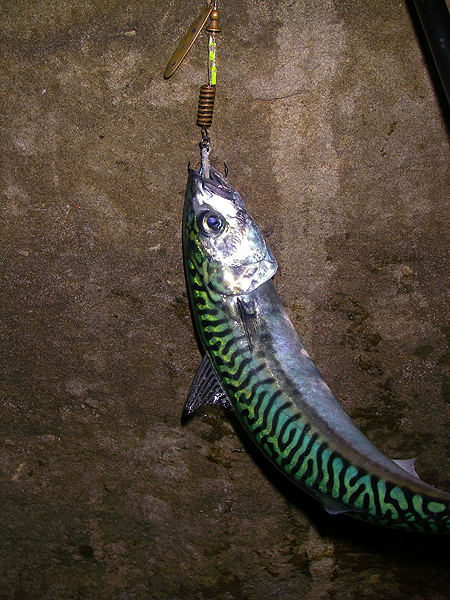 After a little while I swapped John's plug for my other, size 2, glow-in-the-dark spinner, this one with a single hook and he too began to catch fish on most casts. All in all we fished for about three quarters of an hour and I've no idea how many fish we caught but it was a lot. As we trudged back up the cliff path it was just about sunrise and if John's comments were anything to go by he'd thoroughly enjoyed catching 'his first real sea fish'. I guess that we both ate our breakfasts with a feeling of satisfaction.